The Planning and Community Development Commission will be reviewing the draft Lyons Primary Planning Area master plan at a workshop tonight, Jan. 9, beginning at 7:00 p.m. in the Town Hall Board Room. At this workshop, the PCDC will determine whether the first public hearing to adopt the draft LPPA master plan can be scheduled, or if more review time is required. Please join the Board of Trustees and Town Staff for a Town Hall Meeting on Wednesday, January 11, beginning at 7:00 p.m. in the Town Hall Board Room. The event will include a recap of 2016, and a look ahead into 2017 objectives. Do you have a passion for the arts? Interested in preserving and enhancing Lyons' art presence? Join the LAHC! The Lyons Arts and Humanities Commission plays a pivotal role in maintaining Lyons’ unique character. Check out some of the efforts LAHC is involved with: Town Hall Art Shows; public art throughout Town; Arts on the River & Sounds of Lyons; Lyons Last Thursdays Art Stroll; Farm to Table Dinners; ‘String of Pearls’ Bridge; artists’ housing; Space to Create/Artspace; Lyons Professional Theater; Lyons Flood Memorial; and Quilt Shows in Lyons. If you’re interested in being a part of strengthening Lyons’ colorful and active art presence, considering applying for the LAHC! And help preserve our community's funkiness! Individuals interested in serving on a board or commission are asked to submit an application. Help make a difference in your community! Tuesday, Jan. 17 | 6 to 7:30 PM | Lyons Elementary Library | Free Dinner! 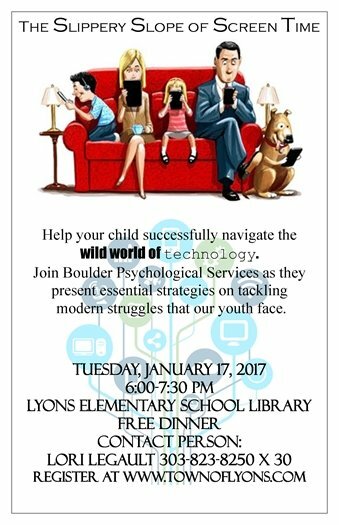 Join Boulder Psychological Services on January 17, beginning at 6:00 p.m. at the Lyons Elementary School Library, as they discuss tactics to navigate through our technological-driven society. Come hungry and enjoy a complementary dinner! Please register here. This free event is sponsored by the Lyons Parks and Recreation Department and the Lyons Elementary School PTO. Don't miss this 90-minute class focused on goal-setting, spending plans, net worth, savings plan, getting rid or debt, and more! 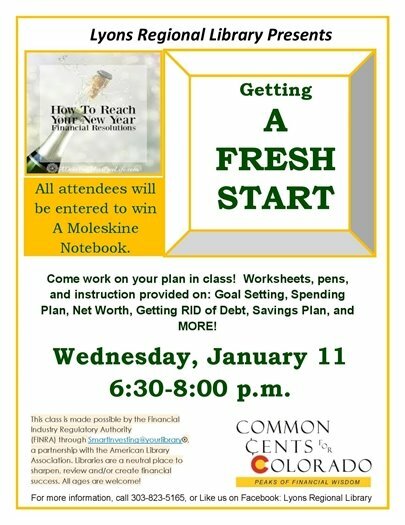 For more information, call the Lyons Regional Library at 303-823-5165. The Boulder County Transportation Department and the State of Colorado are hosting a series of public meetings to present draft floodplain maps for major stream corridors in the unincorporated county. These maps are from the Federal Emergency Management Agency (FEMA) and the Colorado Hazard Mapping Program (CHAMP). These sessions are an opportunity for the public to review draft updated map information for locations in unincorporated Boulder County as listed for each meeting below. Locations outside of the defined map review areas for each meeting will not be discussed. Additional public meetings will be scheduled as additional map updates are received.